Jeita Grotto is a system of two separate, but interconnected, karstic limestone caves spanning an overall length of nearly 9 kilometers. The caves are situated 18 kilometers north of the Lebanese capital Beirut. 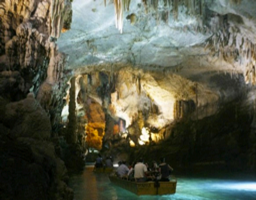 Though inhabited in prehistoric times, the lower cave was not rediscovered until 1836 by Reverend William Thomson; it can only be visited by boat since it channels an underground river that provides fresh drinking water. In 1958, Lebanese speleologists discovered the upper galleries 60 meters above the lower cave which have been accommodated with an access tunnel and a series of walkways to enable tourists safe access without disturbing the natural landscape. The upper galleries house the world's largest known stalactite. The galleries are composed of a series of chambers the largest of which peaks at a height of 120 meters. Aside from being a Lebanese top tourist destination, the Jeita grotto was a finalist in the New 7 Wonders of Nature competition. The Cedars Forest is the national emblem of Lebanon. 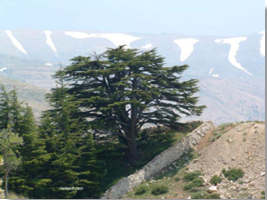 North Lebanon’s Cedar Forest near Bsharri, the Cedars of God, represents only small remnants of the original forest. The first attempt at preserving the Cedar forest was made by the Roman Emperor Hadrian. The Mamluk Caliphs during the Middle Ages attempted at conserving the Cedars. In 1832, the Maronite Patriarch placed the majestic trees under his protection. In 1876, Queen Victoria financed a wall to protect the Cedars of God from the ravages of goat herding. Beirut is the capital and largest city of Lebanon. Located on a peninsula at the midpoint of Lebanon's Mediterranean coast, it serves as the country's largest and main seaport. The first mention of this metropolis is found in the ancient Egyptian Tell el Amarna letters, dating from the 15th century BC. The city has been inhabited continuously since then. The city is the focal point of the region's cultural life, renowned for its press, theatres, cultural activities and nightlife. 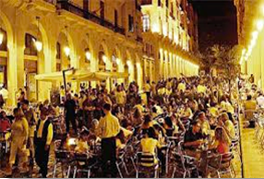 After the destructive Lebanese Civil War, Beirut underwent major reconstruction, and the redesigned historic city center, marina, pubs and nightlife districts have once again made it a tourist attraction. Beirut was named the top place to visit by The New York Times in 2009, and as one of the ten liveliest cities in the world by Lonely Planet in the same year.